I have many western buckles, bola ties and a few sets with matching buckles and bolas or buckles and collar tips with several different stones available. My Dad was a rockhound before he died and delighted bringing home pretty rocks to cut and polish to make jewelry. I have bolas, buckles, pendants and pins of snowflake obsidian, malachite, jasper, dinosaur bone, agate, rhodochrosite, turquoise and probably a few other stones whose names I forget. This is just a representative grouping of what's available, come by and take a look. Lots of extra Cabochons, too! 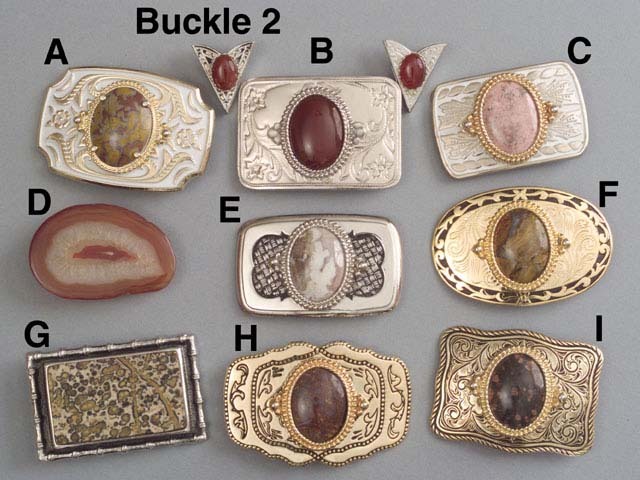 Buckle prices range from $20 to $50 depending on the value of the stone.